The 2018 Christmas Display is now off for the season. Click here for pictures from the 2018 Christmas Display. We were able to raise $324.52 for the 4 Diamonds Fund through the 2018 Christmas display. Special thanks to everyone who helps each year with the display. Your help is greatly appreciated! To view pictures and video from the 2017 Christmas Display click here. Welcome to our site! This site shows the various displays we set up year after year. A special thank you to all that help out with the display year after year! Be sure to visit his site for more information on custom voiceovers for your next event you may be having. Throughout the rest of the year be sure to check out other various displays we put together. You can check out updates on our FaceBook page. Updates on the current status of the light display will be posted there. Additionally, you may leave any comments here in our Guestbook. During the 2016 Christmas season, we were able to raise over $231.19 this year through our display for the 4 Diamonds Fund. To learn more about the 4 Diamonds Fund you can click here. Thank you to everyone who stopped by during to see the 2016 Christmas Display! We'll be looking forward to another great season in 2017! Click here to find out where my inspiration came from that started all of this and to learn more about Frank Weihrauch's Christmas display. Want to see some more Christmas lights? Be sure to check out the new Google Map of other local displays in our area! 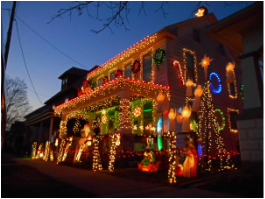 See the Amazing Christmas House!